FAYETTEVILLE, Ark. 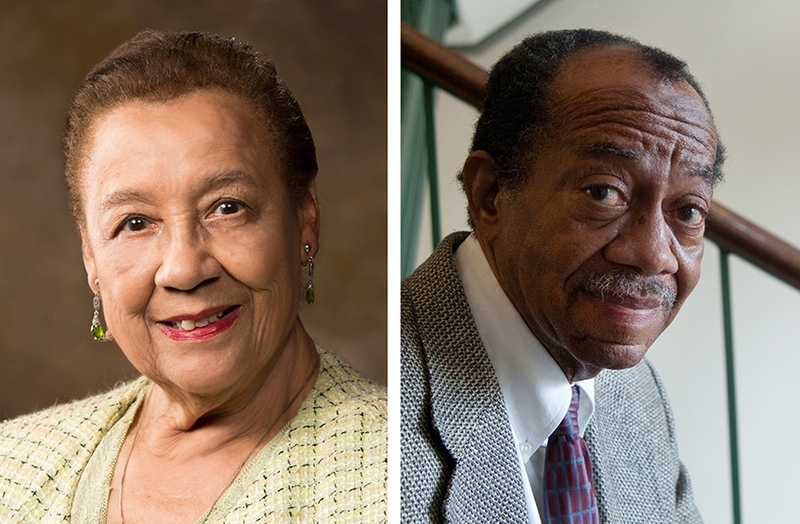 - Two University of Arkansas residence halls have been renamed in honor of retired professors Margaret Clark and Gordon Morgan, the first two African American professors at the university. The U of A Board of Trustees approved the naming on Thursday, Jan. 31, at the board's regular meeting on the Univerity of Arkansas for Medical Sciences campus in Little Rock. "Dr. Clark and Dr. Morgan were great teachers and scholars, but they also played a critical and consistent role in helping make the university a more welcoming place to all who came, showing students the path toward success through their words and their actions," said Chancellor Joe Steinmetz. "It is a great honor for the university to have two buildings named in honor of each of them." "We are truly honored to be able to recognize the legacies of these educational pioneers," said Charles Robinson, vice chancellor for Student Affairs. "Dr. Clark and Dr. Morgan have always represented the best of what the university strives to be towards each student everyday." The Northwest Quad was built in 2004 as four residence halls with a connected dining facility to serve the university's growing student enrollment. Residence hall B in the Northwest Quad will be named Gordon Morgan Hall, and residence hall C will be named Margaret Clark Hall. Two other residence halls in the Northwest Quad were previously named in honor of former U of A Presidents Willard Gatewood and Arthur Harding, and the dining hall is named in honor of Roberta Fulbright, a university benefactor and mother of J. William Fulbright. Dedications of the building names will occur at a later date. Margaret Clark began her teaching career at the University of Arkansas in 1969 after earning a master's degree in 1968. She initially taught world languages including French while working on a doctorate in education. She was appointed an assistant professor of secondary education in 1972 in the College of Education and Health Professions. She earned her Doctor of Education in 1978. She became an associate professor of secondary education in 1994. She has served on the Board of Directors of the Arkansas Alumni Association and the Washington County Historical Society and was a member of the Arkansas Division of the American Association of University Women. She also served as the first president of the Phi Alpha Omega chapter of the Alpha Kappa Alpha Sorority Inc. Among other honors, she has been awarded the Silas Hunt Legacy Award, the Outstanding Faculty Award and the Martin Luther King Jr. Lifetime Achievement Award. She retired in 1998, taking emerita status but remaining active in community affairs. Gordon Morgan was hired as an assistant professor in the Department of Sociology in 1969 and climbed the tenure ladder to associate professor, full professor and then the rank of University Professor. He is a member of the Black Alumni Association and the Arkansas Alumni Association. Morgan received the Silas Hunt Legacy Award, a National Endowment for the Humanities Teaching Fellowship and a Ford Foundation Fellowship, among other honors. He received the J. William Fulbright Distinguished Alumni Award in 2006.
examining the first 40 years of campus life since desegregation began at the U of A in 1948. He and his wife also established the Gordon Morgan Family Scholarship for minority students at the U of A. He retired and took emeritus status in 2012.